Why an M.O.T. certificate ? Homepage Need a V5 Registration Document ? Why an M.O.T. ? An old M.O.T. 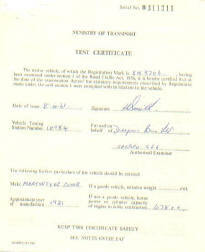 testing certificate that shows the registration number and frame number of the machine for which you are claiming the registration number can be very useful. It confirms the existence of a machine with its registration number. Older styles of certificate do not, unfortunately, record the frame number but are still valid evidence.